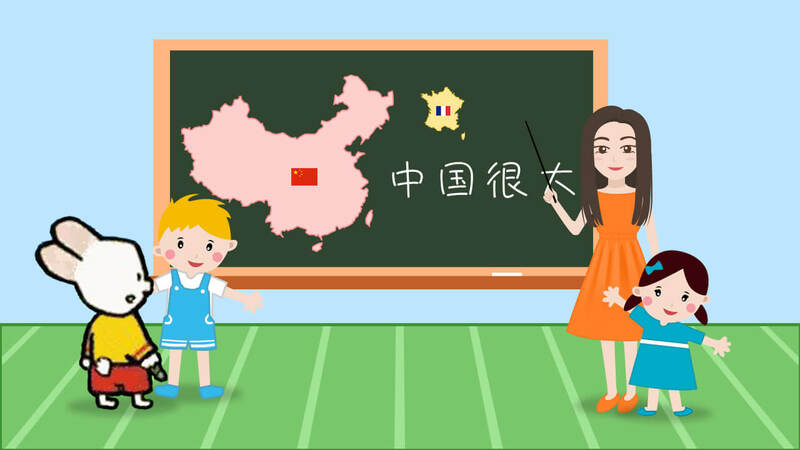 After the first self-introduction class, the second lesson for my French students focused on the introduction of Chinese language and its geography. For the course materials, I prepared pictures and charts to compare the surface and population between China and France. In this way, the students could easily understand China is one of the largest countries in the world with a huge population. Since the students had learned "Hello" in last class, I planned to teach two words "goodbye" and "awesome" for the second lesson. As the class approached, my French students entered the classroom one after another. What surprised me was that all of the students greeted me with "Ni Hao" instead of "bonjour"! It seemed that they have done a lot practice after the first lesson. I started my class by asking them “what’s China like in their mind?” They got excited about this question and gave me a lot of different answers. After discussing the topic, I taught them how to speak the words they already know about China in Chinese, such as panda, dumpling and dragon. While I was still explaining those characters, some students already started to practice them in their notebook. In order to help students understand the “character-based constructional approach to Chinese”, I played a Chinese cartoon “The Story of 36 Chinese Characters" which vividly illustrated where Chinese characters came from. After watching the cartoon, I asked students to tell me what characters they saw from the cartoon. Without knowing any knowledge of the Chinese characters, those kids figured out 90% of the 36 Chinese characters! So proud of them! Learning Chinese through cartoon image of Chinese characters is like we learn traffic rule through reading road signs. It’s just like that easy! To introduce the four tones in Chinese, I chose a simple but complete sentence for them to listen and repeat, “中国很大” (China is very big), which contains four simple characters with a full range of four tones. This simple example allows students to practice this tonal language easily. They got so excited about different tones on Chinese and kept repeating these four Chinese characters, it was such a big achievement for those France students who just learning Chinese second time! The residual heat of the Chinese name has not been dispersed from other classes. During the break, students from other classes still came to me to asking their Chinese name. Several girls from the pilot class chatted with me and introduced me to others as their “Chinese friend”. After the break, I taught the students two new words “再见goodbye" and "真棒awesome". Not only taught them how to read and write, I also showed them how to find theme-based cartoons and videoclips of key Chinese characters on hihilulu. By searching the Chinese character they already know on hihilulu, the students could play the interactive games to practice their pronunciation and writing. The goal for using hihilulu platform is to help students learn in a rich Chinese content environment immensely. After two introductory lessons, students started to know a bit about this new language that they will continue to study for six months and to have a general picture of China. All of my students said they were so excited and could not wait for the Chinese New Year cultural event!